[re]frame Manila for the Women of Lumban, LagunaDr. Bennett describes the community of Lumban as very religious and where he learns to drink Tanduay with the locals. The main source of livelihood for the women is embroidery and for men is wood work. They were asked to submit designs to be installed in wooden frames as a permanent artwork in the hallway of De La Salle – College of St. Benilde’s School of Design and Arts in Malate, Manila. During the inauguration, these women were invited and most of them almost cried as they see their masterpieces beautifully arranged on top. It was all about respect and recognition. None of them talked about the money they were paid for. He remembers these women who never stops eating while doing it before. After the ceremony, though they were given hotels to sleep for a night, a number of them wanted to sleep near or under the artwork. DasManila for the Women of Dasmariñas, CaviteDasmariñas is a community where a number of people recycle garbage by gathering, cleaning and weaving by hand. Interesting enough, Dr. Bennett searched those who can make a craft out of it and came up with a design of a flower where Manila is named after, the “nilad”. He shares what blocks him to keep his project on going smoothly is the rampant red tape for public places. He thinks that corruption in this country is probably the worst of all public concerns. Good thing he found Ayala Museum where the visibility is superb to display his art work. 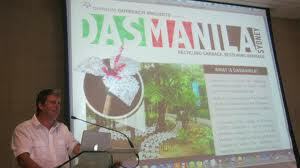 He received many positive feedbacks and on March 15th this year, DasManila will be exhibited in Sydney Australia. Image taken from “Creative Outreach: Social Development Through Art & Design” with Dr. Rick Bennett of the University of New South Wales, Australia on January 29, 2011, 3:30 pm at the Luna Room, Ayala Museum in Makati City. In Love or in Lust: Poetry is the Answer!